Click Here to get Pre-Approved Now! "Helping You Ride Since 1995!" This battery-powered handheld blower bundle comes standard with battery and charger, and combines great power and long run times. Part of the STIHL Lightning Battery System™ line of products, the BGA 56 combines STIHL performance and exceptional value. Its powerful motor delivers air speeds of 100 mph and an air flow of 353 cfm at the nozzle. It features an adjustable tube to fit different user heights for enhanced comfort. 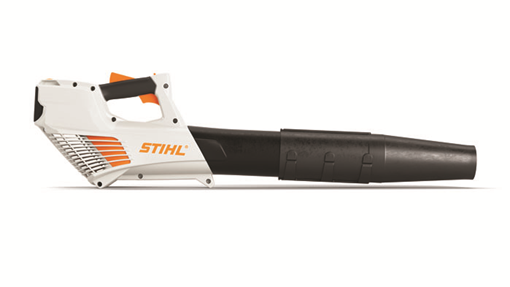 Clear a sidewalk, seven football fields long, on a single charge with this STIHL AK Series handheld blower. The BGA 56 is also just 7.3 lbs. (including battery) for easy portability and maneuverability. And when you’re done, hang it on the wall from its onboard hanging slot. The BGA 56 bundle comes standard with the AK 20 battery and AL 101 battery charger. The BGA 56 is also available as a stand-alone unit without battery and charger. BUILT IN THE USA: Indicates products that are built in the United States from domestic and foreign parts and components. REDUCED-EMISSION ENGINE TECHNOLOGY - Caring for Nature: The STIHL Inc. “Caring for Nature” seal identifies its powered products that are more environmentally conscious, producing zero or low exhaust emissions. STIHL Inc. defines “low exhaust emissions” as being cleaner than EPA and/or CARB exhaust emission standards. LIGHTWEIGHT PORTABILITY: Great for maneuverability and extended use.